I loved Valentine's Day as a child. Not because of the whole love aspect of it...I mean, after all, boys were not even in my mind as a 5th grader. No, I loved it because of all of the pretty pink decorations, making fun crafts and candy! The artsy girl I have always been was all about it. Cutting out sparkly pink hearts to give away (probably to my Mom or Dad at that point) and receiving candy was the high point of this time of the year! Although I accepted all candy, I admit I thought those conversation hearts were gross. Sorry if you like them, but I just thought they were cute not edible. Chocolate however was another story. I usually got a box of chocolates from my Grandmother, who was the most festive woman you will ever meet when it came to holidays. I very much enjoyed guessing which chocolates I was about to eat as I plucked them from their papers in the box. My favorite were always the caramels and the red fruit creams (like strawberry and raspberry). Those were good times, but It has been ages since I have bought a box of chocolate because I prefer to make my own raw deliciousness. I never will be guessing what flavor the chocolates are, but I can give that pleasure to those I give the chocolates to! I made quite a few this year, and of course one had to be delicious fruit cream. 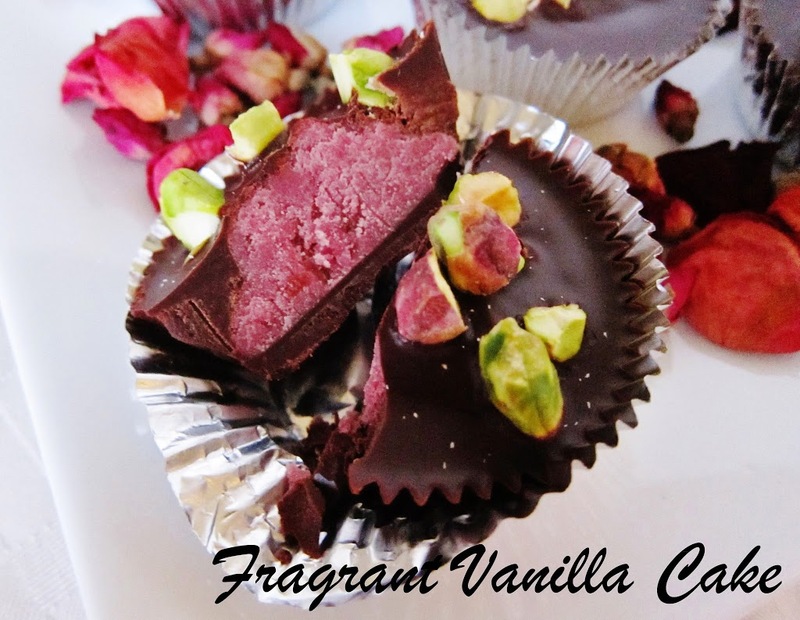 I decided on cherry rose, since I have been using a lot of berries lately and I already have a Raspberry Rose Truffles Recipe on my website. Cherry is delicious with dark chocolate and rose so I got pretty excited about these! 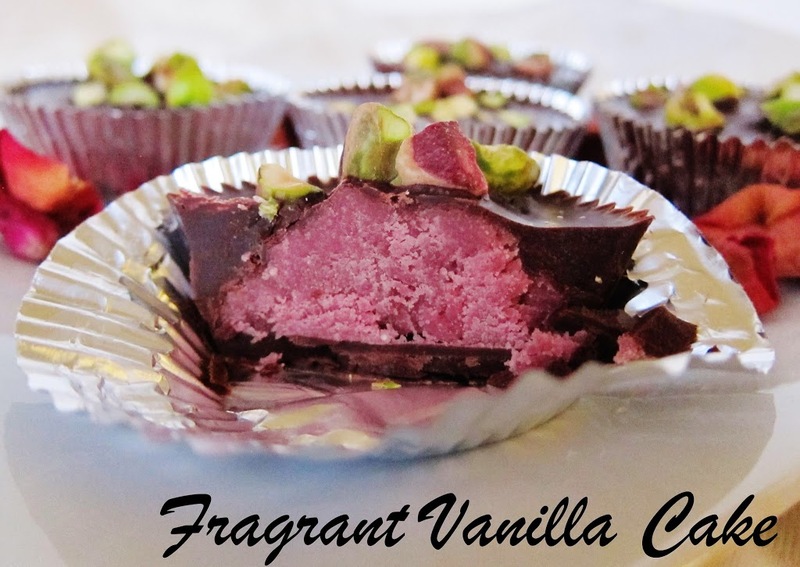 I sprinkled them with pistachios for color and crunch, and they were simply heavenly. If I got a box of these I would get excited. So much better than a bouquet of flowers any day. 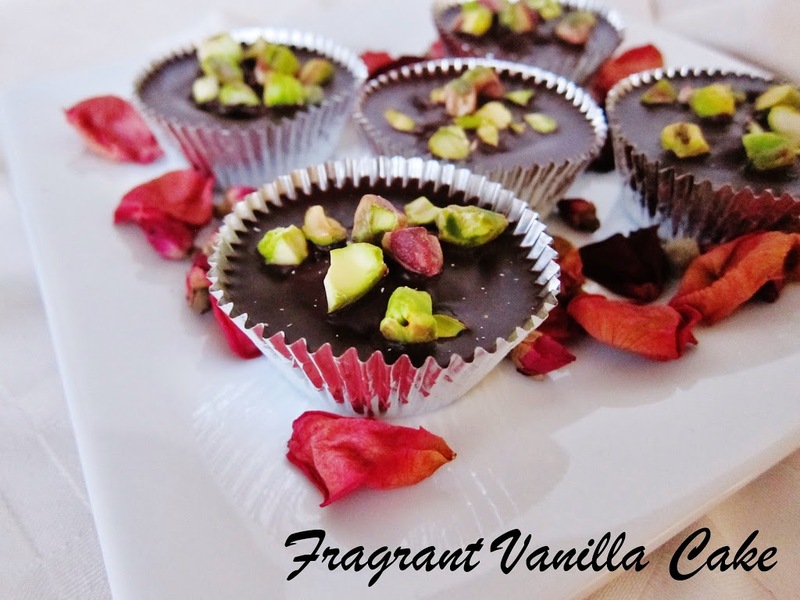 Who doesn't love the gift of raw vegan chocolate?! To make the chocolate, combine all ingredients and whisk together until smooth. Take your chocolate tins and fill half full with chocolate. Place in the freezer to harden. Meanwhile, whisk together filling ingredients until smooth. Once the chocolate has hardened, take your filling, and spoon one mound into each tin on top of the chocolate. Place in the freezer to set for about 5 minutes. 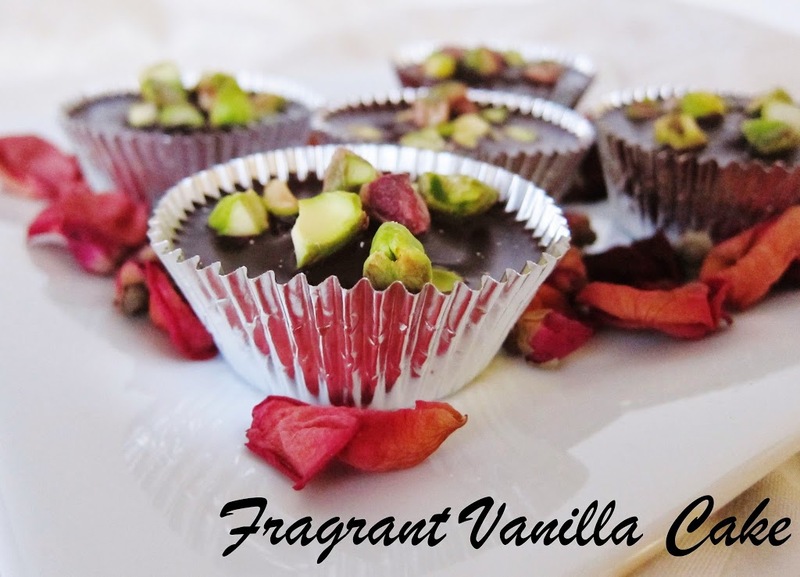 Top with remaining chocolate so it is even with the top of the tins, and sprinkle with pistachios. Place in the freezer to harden, and enjoy! Store in the fridge. Thank you :)! I hope you did try them ;)! 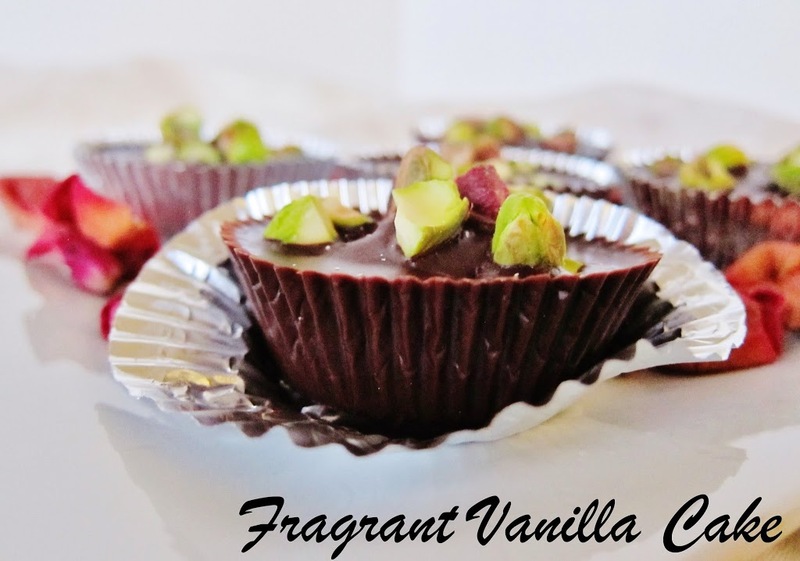 I do not have coconut butter or nectar, but now I have a need to make these! Another liquid sweetener such as maple syrup or raw agave nectar can be subbed in for the coconut nectar, but the butter you will need to get ;)! Not sure if I know the differece between coconut butter and coconut oil? Where do I find coconut butter? And rose water? Coconut butter is the whole ground coconut flesh and oil is just the oil. You can make your own by blending finely shredded dried coconut in a high speed blender for about a minute, using the tamper to press it into the blades until you have something the consistency of nut butter. Or you can buy it online http://www.vitacost.com/artisana-organic-raw-coconut-butter-16-oz<br />As far as rosewater goes, you can find it at some whole foods stores, or at middle eastern markets or online. Just make sure it does not have additives. Thank u for your advice!